Сначала о "сладком": мы разыгрываем конфету - полный набор штампов серии Colour Me (Раскрась меня). Мои работы с некоторыми из них можно посмотреть здесь и здесь. Для участия в розыгрыше пройдите по блогам всех дизайнеров международной команды и оставьте свои комментарии. Окончание блог-хопа 31 марта с.г. Now to my card. 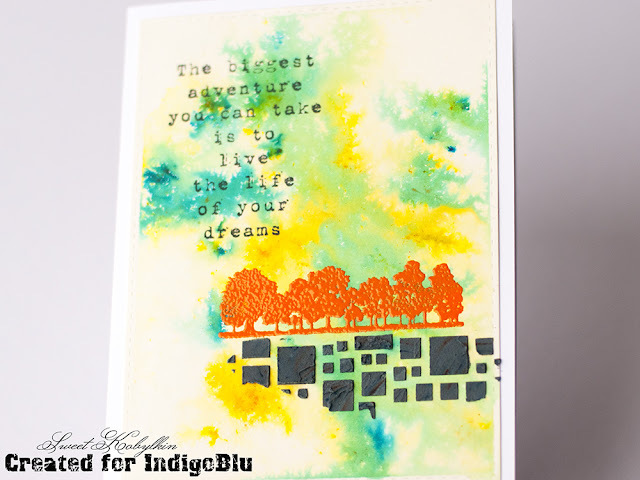 Today I am sharing my new DT project for IndigoBlu featuring one of my favourite stamp sets Grand Tour III that has been re-released recently. I sprinkled colouring crystals over a cardstock panel, spritzed water onto it and watched water creating magic. 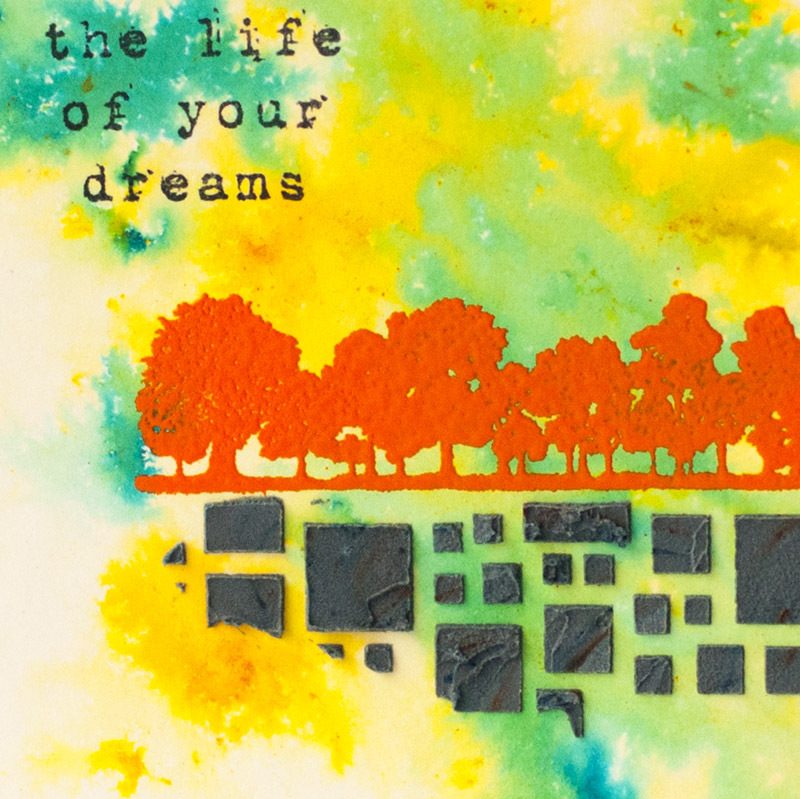 When the panel dried I stamped the sentiment in black ink and heat embossed the trees in bright orange embossing powder. Then I mixed some black crystals with texture paste and applied it through the stencil. When the paste solidified I assembled the card. Сегодня я показываю свою новую работу для IndigoBlu с перевыпущенным набором штампов Grand Tour III. Я присыпала панель из кардстока смесью кристаллов и сбрызнула её водой, которая моментально начала творить чудеса. Когда панель высохла, я сделала оттиск черными чернилами надписи и горячий эмбоссинг деревьев. В завершение я смешала черные кристаллы с текстурной пастой и нанесла её через трафарет. Я регулярно выкладываю различные фото в Instagram. Если это Ваша любимая соц сеть, подписывайтесь на @sweetkobylkin и заходите поболтать. Thanks for stopping by! I wish you all a Happy Friday! Спасибо, что заглянули! Желаю всем прекрасного начала уикэнда! LOVELY creation .. love this hop! this is so awesome! wonderful! Love these bright, happy colors, Ksenija! Each of these cards is gorgeous! 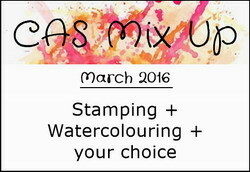 Thanks for sharing with us again at CAS Mix Up! Such a true saying and wow colours make this card a wonder creation to receive. Thank ytou for sharing. Gorgeous, love those bright colors. And the sentiment is so beautyful. Крутая работа! Очень яркая и позитивная, летом запахло так конкретно! This is a very striking design with the bright colours. At first I thought the orange trees were die-cut as they looked so dimensional! what a brilliant, colorful card; I like the dimension and texture! Fabulous mixed media card gorgeous colours a very happy card. These colours realy pop of the screen! Fun and so cheerfull layput! powerful colours and great composition of textures!! Beautiful creation and such a fresh colors. 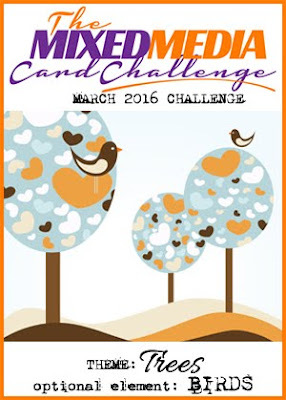 Thank you so much for joining our Crazy for Colors challenge at Anything But Cute! A stunning colourful card! Love it! Love your bold colours on this design ! This is absolutely beautiful! 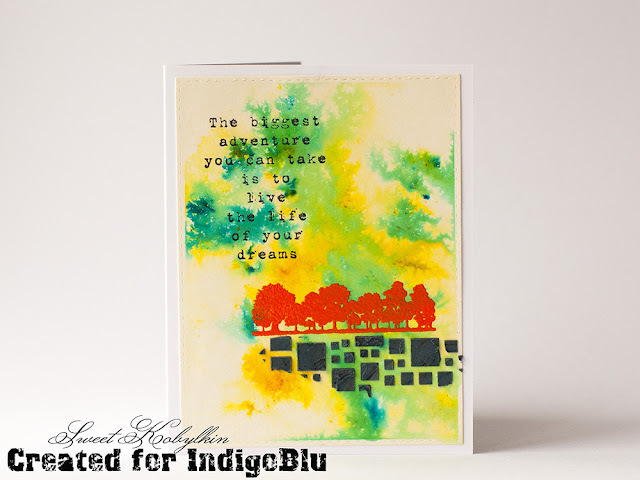 Your color burst and quote meld perfectly! Thank you for sharing! What a stunning design, Ksenija! I adore the colors and texture! So happy you could join us at The Mixed Media Card Challenge! What a great and very colourful background you have made and the stamping and stenciling pops against it so nicely. Thanks for joining us at Anything But Cute. oh my, love your take! so happy, bright colours and fab design! love it. thanks for playing along with us at MMCC!!! I love your card, so inspiring and happy.